Apple CEO Tim Cook, who has been summoned to testify in a Senate hearing on offshore tax practices, now has to do something no other Apple CEO did before him: take the witness table at a congressional hearing on Capitol Hill. Apple ahead of the hearing published a 17-page written testimony which details its push for a fair tax reform: it should be revenue neutral, Apple writes, eliminate all corporate tax expenditures, lower corporate income tax rates and implement a reasonable tax on foreign earnings that allows free movement of capital back to the U.S.
It’s not clear why the U.S. Senators singled out Apple as many other companies don’t repatriate the money earned overseas due to the steep 35 percent tax. It’s important to note that what Apple and others are doing isn’t illegal. Moreover, Apple is compelled to do what is in both their and their shareholders’ best interest. Ahead of the hearing, Reuters writes Ireland has denied helping Apple pay just two percent corporate tax on its Irish earnings rather than the normal 12.5 percent, a fact discovered and made public yesterday by the Senate Permanent Subcommittee on Investigations. Ireland said on Tuesday it was not to blame for Apple Inc’s low global tax payments after the U.S. Senate said the company paid little or nothing on tens of billions of dollars in profits stashed in Irish subsidiaries. Under Cook, Apple recently hired as a lobbyist Jack Krumholtz, who founded Microsoft’s Washington office in 1995. Apple’s lobbying bill rose in the first quarter of 2013 to $720,000 from $500,000 in the same period of 2012, according to filings. The sum, however, is still less than the $2.5 million Facebook spent in the quarter or Google’ s $3.4 million, Bloomberg writes. A live stream of the hearing is available via C-SPAN. If you’re on an iOS device, you can watch the hearing over at NBC News. You can also check out opening statement of Senator Carl Levin and John McCain or read part 2 of the Permanent Subcommittee On Investigations. Senator Carl Levin (D-MI), chairman of the U.S. Senate Permanent Subcommittee on Investigation and an iPhone owner, read a prepared statement accusing Apple of funneling the money through a complex web of subsidiaries in Ireland and elsewhere. He’s calling for the Congress to close the tax loopholes to protect domestic companies which are not being creative in their tax evasion strategies as the likes of Apple, Google and others. Levin also asserted that tax avoidance is hurting the economy and imposing budget cuts. Senator John McCain (R-AZ) says “it’s important all of us make it very clear the admiration we hold for Apple,” before attacking Apple over avoiding paying taxes on $44 billion in income earned overseas over the past six years. It’s completely outrageous that Apple has avoided paying US taxes and indeed avoided paying taxes around the world with its convoluted and pernicious strategies. “The American people will not tolerate it,” McCain said, to which Senator Rand Paul responded that politicians “try to minimize” their taxes while noting that Apple hasn’t done anything illegal. I have a bill that would tax repatriated money at five percent and target that money to infrastructure. We need to apologize to Apple, compliment them for the job creation they’re doing, and get on with our job and redo the tax code. Here’s what he wrote on Twitter. We did not drag them, they have come here willingly. We intend to hear from them and some experts. Professor Richard Harvey from Villanova, who reviewed Apple’s tax strategy, claims the company is “within the bounds of what is acceptable under International tax law,” in spite of paying they very little tax on income recorded in Ireland. Senator Paul argued that America’s 35 percent tax on repatriated income is “chasing people away from us” and noting the subcommittee should be giving Apple “an award today” for obeying the law. Since the government is perpetually in a state of perceived fiscal crisis, it would be ideal to raise revenues from companies that are percieved as “tax dodgers” rather that turn the screws on actual people who can legally vote. 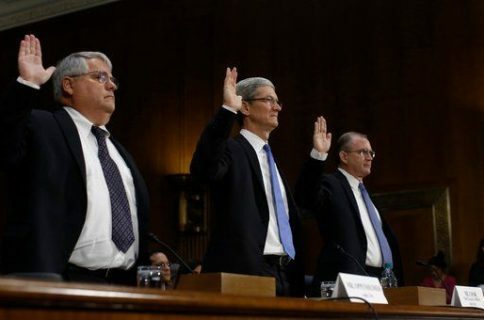 Apple CEO Tim Cook, the company’s finance chief Peter Oppenheimer and head of tax operations Phillip A. Bullock are now appearing in front of the Senate panel. We’ve chosen to keep the design and development of our revolutionary products right here. Over the last decade, our workforce grew by fivefold. We have employees in all fifty states. 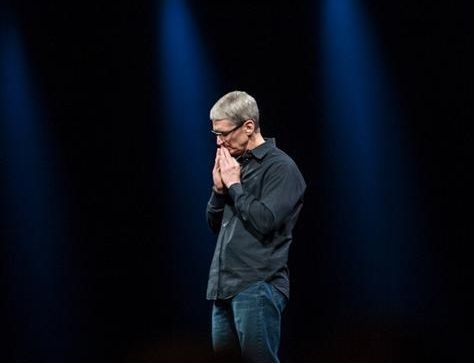 All told, Cook estimates Apple created or supported 600,000 new jobs in the U.S while investing billions to “create even more American jobs.” He also re-iterated that some iPhone components are made by U.S. companies in Texas and Kentucky. We’re investing $100 million to create a line of Macs in the U.S. later this year. This will be assembled in Texas, and rely on equipment and supplies from other states. In addition to ‘Made in USA’ Macs, Apple of course runs massive data centers in the country, including a huge new facility in North Carolina. They are also building additional data centers in Oregon and Nevada and investing in a new campus in Texas and a brand new iSpaceship headquarters in Cupertino. And what’s Apple doing with all that money? We use this money to finance construction of Apple retail stores around the world and fund production of products. It would be very expensive to bring that cash back to the United States. Unfortunately the tax code has not kept up with the digital age. We are handicapped in relation to our foreign competitors who do not have such constraints on the free movement of capital. He then quoted President Kennedy. We believe in President Kennedy’s phrase: to whom much is given, much is required. We strongly believe that such reform would be fair to all taxpayers and would keep the U.S. competitive. Finance boss Peter Oppenheimer explained Apple’s U.S. operational structure. We sell and support products through our retail stores and partners. Outside the U.S., we strive to provide the same sales in support as our customer expect in the U.S. Apple’s presence in outside countries often takes the form of Apple-owned subsidiaries. These acquire products from other Apple subsidiaries which in turn buy product from Apple contract manufacturers. But what about those Ireland subsidiaries, Pete? Apple and Apple Ireland use a cost-sharing R&D agreement to fund research. In return, Apple Ireland receives rights to sell products in Europe and Asia. For many years, our Irish subsidies have had thousands of employees in Ireland. The fact that our subsidiary does not pay taxes in Ireland does not affect our U.S. tax payments. As a reminder, Apple is moving the money through Apple Operations International (AOI), which was incorporated in the southern Irish city of Cork in 1980. AOI has not filed an corporate income tax return on revenue earned overseas. Apple Inc. pays U.S. income tax on revenue it receives as a passthrough. AOI and other Apple subsidiaries own intellectual property rights to Apple IP overseas. There is no U.S. tax on the transfer of balances from subsidiaries to other subsidiaries. Our companies pay the appropriate taxes in Ireland as per our agreement with the Irish government. We created AOI in 1980 and the relationship between Apple and the Irish government still exists today. We’ve built up a significant skill base there of people who have a significant understanding of the European market. AOI is nothing more than a holding company, a concept that many companies use – it’s not an operating company. The dividends that go into this company have already been taxed appropriately in their local jurisdictions. AOI to me is nothing more than a company that has been set up to provide an efficient way to manage Apple’s cash. From income that’s already been taxed. The investment income that comes out of AOI is taxed in the United States at the full 35 percent rate. AOI does not reduce our US taxes at all. Asked by McCain whether the fact that AOI, ASI and AOE have no tax residence sounded logical to Cook, the Apple CEO replied that ASI and AOE are “paying Irish taxes”. I personally don’t understand the difference between a tax presence and a tax residence but I know they fill out and pay Irish taxes. AOI, because it’s a holding company, it only makes investment income. All of that investment income is taxed in the US at the full 35 percent level. If you look at the 35 percent tax burden, that I’m sure we’re in agreement is way too high, you said the purpose of AOI is to ease administrative burdens. Isn’t it obvious that you are not bearing the same tax burden as if you were bearing in the United States? This gives you some advantage over smaller companies located strictly in the US? Sir, I have tremendous respect for you. I see this differently from you. Apple is earning these profits outside the US. By law and regulation, these are not taxable in the US. AOI invests that money overseas and then the interest from those investments is taxed in the US. I see this as a very complex topic and I’m glad we’re having the discussion. Honestly, I don’t see it as being unfair. I am not an unfair person. That’s now who we are as a company and who I am as an individual. I do not see it that way. Cook then revealed Apple’s weighted average cost of borrowing $17 billion to fund its stock buyback program was less than two percent versus paying 35 percent to repatriate. “As we looked at that analysis, we felt strongly that in the best interests of our shareholders to secure the debt,” he explained to McCain. It shouldn’t be zero percent, he joked. The rate on the U.S. sales it would need to be in mid-20s. On bringing back foreign earnings. To incent companies, would need to be a single digit, which means you’re in a revenue neutral situation. Some would pay more, some less, but it would be great for growth. Everything Apple sells in the U.S. is taxed in the U.S., Cook said. For a foreign country, things get a little more complicated. “Generally speaking, it is taxed in the local market and then if its one of the countries that are being served from Ireland, those units are generally sold by an Irish subsidiary,” he said. That income is taxed to the degree it needs to be in the local jurisdiction and then the proceeds go to an Irish subsidiary in many cases called AOI. This acts as a holding company and invests Apple’s earnings. Then we pay taxes on those earnings in the United States. On Apple shareholders, Cook said the company is “widely owned” because it is part of the indexes in the stock market, with its top 50 shareholders owning half the company (think public employee retirement systems, mutual funds like Fidelity or Black Rock, and individual retail shareholders). In Fiscal 2012, the company paid a little over $900 million in international income taxes. We’re projecting that number to be larger this year. That number is significantly larger than a few years ago. I don’t have the statistics available but similar to the US there are employer contributions to payroll tax, and considerable amount of VAT and GST that is connected and remitted to various countries. 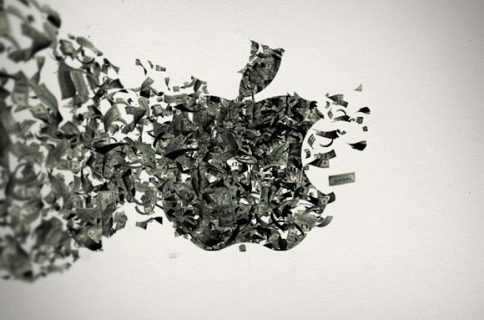 By the way, Apple can’t use its overseas cash to make any investments in the U.S. I think that the US court system is currently structured in such a way that its very difficult to get the protection a tech company needs because our cycles are very fast. The court system is very long, and the foreign competitors in the US can quickly take IP and use it and ship products with it and they’re on to the next product as well. I would love to see conversations between countries and see protections between IP globally. For us, our intellectual property is so important, I would love the system to be strengthened in order to protect it. Samsung pays a corporate tax rate of just 25 percent in South Korea and Apple’s Oppenheimer noted that its rival “is able to freely move its income, whereas we cannot,” which also affects not only Apple’s, but every U.S. company’s global competitiveness. If we don’t reform the tax code, we’re competing with one hand tied behind our back. Almost all of our industrial competitors have shifted to a territorial system including the UK, France, Germany, Japan. I think that’s the right way to go. They don’t tax active business income earned beyond their borders and their businesses are more competitive as a result. $1.5-$2 trillion is locked up overseas. That money is being deployed to put factories and R&D overseas. We’ve got to move quickly. No other nation erects such a high barrier to bringing earnings back to the US. Every one of our global competitors have reformed their tax systems since we last reformed ours. Not just the rate, but the code. If we don’t reform, we’ll continue to lose opportunities. We need to create competitiveness so we can get new customers overseas. Tightening rules related to IP income is important too. If you’re interested in more of this stuff, MacRumors has a live blog up with more quotes and detailed back and forth between Apple execs and the subcommittee.